So far the HOTTEST new trend this fall is leopard. Not just a statement piece, but leopard EVERYTHING. It’s actually incredibly chic when you style two leopard prints together. I love how this t-shirt and skirt look together, and I’m dying over these leopard print pants. The best part about leopard is that it never goes out of style. 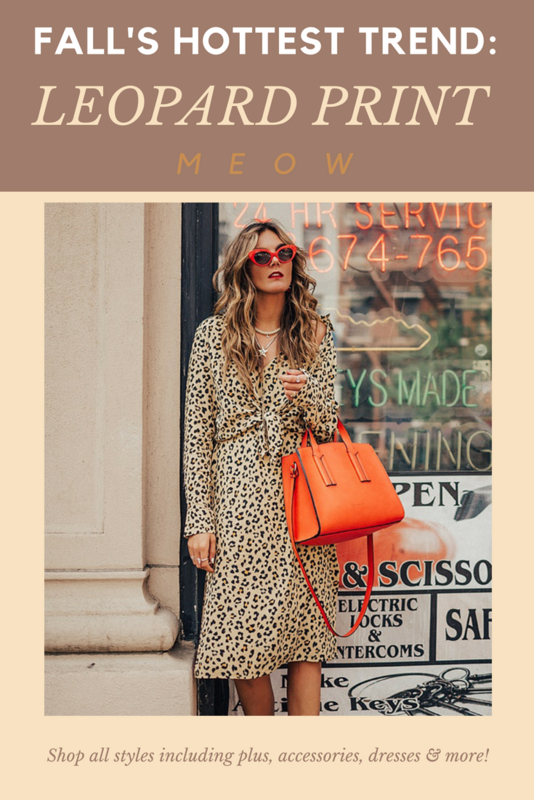 It is such a great print for fall and winter, I mean who wouldn’t want to look like a fierce feline in this leopard fuzzy jacket or this long leopard cardigan? I love this trend because it’s fun! Style leopard on leopard, style it with black, style it with white – your options are endless. There are so many ways to wear leopard. One of my favorite ways to style it is to play it up with the accessories. I love this leopard clutch, or these fun leopard booties. This fall are you ready to be the fiercest feline in the jungle? Can you give a buy link for the leopard print dress in the pic please? Love it and NEED it! Hello! I’m not sure if the exact set is still available, but this is the retailer and they have a ton of similar options. Shop here! Leopard prints have been dominating the fashion world from past many years. Calling them timeless would not be wrong. And its still roaring the fashion world. I love this comment! I totally agree it’s such a timeless style!